This article is about the collie group of dog breeds and landraces. For other uses of the word "collie", see Collie (disambiguation). See Rough Collie, Smooth Collie and Border Collie for those breeds. Collies form a distinctive type of herding dogs, including many related landraces and standardised breeds. The type originated in Scotland and Northern England. Collies are medium-sized, fairly lightly built dogs, with pointed snouts. Many types have a distinctive white color over the shoulders. Collies are very active and agile, and most types of collies have a very strong herding instinct. Collie breeds have spread through many parts of the world (especially Australia and North America), and have diversified into many varieties, sometimes mixed with other dog types. Some collie breeds have remained as working dogs for herding cattle, sheep, and other livestock, while others are kept as pets, show dogs or for dog sports, in which they display great agility, stamina and trainability. While the American Kennel Club has a breed they call "collie", in fact collie dogs are a distinctive type of herding dog inclusive of many related landraces and formal breeds. There are usually major distinctions between show dogs and those bred for herding trials or dog sports, the latter typically display great agility, stamina and trainability, and, more importantly, sagacity. Common use of the name "collie" in some areas is limited largely to certain breeds—meaning Rough Collie in parts of the United States, and meaning Border Collie in many rural parts of Great Britain. Many collie dog types do not actually include "collie" in their name (see Welsh Sheepdog at right). The exact origin of the name collie is uncertain; it may derive from the Scots word for 'coal'. Alternatively it may come from the related word coolly, referring to the black-faced mountain sheep of Scotland. The collie name usually refers to dogs of Scottish origin which have spread into many other parts of the world, often being called sheepdog or shepherd dog elsewhere. Collies are generally medium-sized dogs of about 22 to 32 kg (48 to 70 lb) and light to medium-boned. Cattle-herding types are more stocky. The fur may be short, or long, and the tail may be smooth, feathered, or bushy. In the 1800s, the occasional naturally bob-tailed dog would occur. The tail can be carried low with an upward swirl, or may be carried higher but never over the back. Each breed can vary in coloration, with the usual base colors being black, black-and-tan, red, red-and-tan, white with a colored head with it without other body coloration of sable, black and tan, blue merle, sable merle sable. They often have white along with the main color, usually under the belly and chest, over the shoulders, and on parts of the face and legs, but sometimes leaving only the head colored – or white may be absent (unusual) or limited to the chest and toes (as in the Australian Kelpie). Merle coloration may also be present over any of the other color combinations, even in landrace types. The most widespread patterns include sable, black and white, black and tan and tricolour (black-and-tan and white). Collies range in trainability from the "average" to very biddable. The Border Collie is also the breed most in need of a job, while other collie breeds fit well into an active family lifestyle. A working member of a collie breed, such as the Border Collie, is an energetic and agile dog with great stamina. When in fit, working condition they are able to run all day without tiring, even over very rough or steep ground. Working collies display a keen intelligence for the job at hand and are instinctively highly motivated. They are often intensely loyal. Dogs of collie type or derivation occupy four of the first sixteen ranks in Stanley Coren's The Intelligence of Dogs, with the Border Collie being first. These characteristics generally make working strains suitable for agility; in addition to herding work they are well suited to active sports such as sheepdog trials, flyball, disc dog and dog agility. Working strains have strong herding instincts, and some individuals can be single-minded to the point of obsessiveness. Collies can compete in herding events. Certain types of collie (for example Rough Collies, Smooth Collies, Shetland Sheepdogs and some strains of Border Collie and other breeds) have been bred for many generations as pets and for the sport of conformation showing, not as herding dogs. All collie dog breeds have proved to be highly trainable, gentle, loyal, intelligent, and well suited as pets. Their gentleness and devotion also make them quite compatible with children. They are often more suitable as watchdogs than as guard dogs, though the individual personalities of these dogs vary. The temperament of these breeds has been featured in literature, film, and popular television programs. The novels of Albert Payson Terhune, which were very popular in the United States during the 1920s and 1930s, celebrated the temperament and companionship of his early AKC collies. More famously, the temperament and intelligence of the Rough Collie were exaggerated to mythic proportions in the character Lassie, which has been the subject of many films, books, and television shows from 1938 to the present. The Lassie character was featured in a book titled Lassie Come Home by Eric P. Knight. Knight's collie "Tootsie" was the inspiration for the book, which was a collection of stories based on her and other collie legends he collected from talking to friends and neighbors. One such story was most likely the documented tale of "Silverton Bobbie", the Oregon collie who crossed the US to get to his owners. While the dogs who played Lassie on-screen were from AKC lines, the actual Tootsie looked nothing like them, although she did come from a collie breeder. Some collie breeds (especially the Rough Collie, Smooth Collie and the Australian Shepherd) are affected by a genetic defect, a mutation within the MDR1 gene. Affected dogs are very sensitive to some drugs, such as Ivermectin, as well as to some antibiotics, opioids and steroids – over 100 drugs in total. Affected dogs also show a lower cortisol concentration than normal. The Verband für das Deutsche Hundewesen (The German Kennel Club) encourages breed clubs to test all breeding stock and avoid breeding from affected dogs. Collies may have a genetic disease, canine cyclic neutropenia, or Grey Collie Syndrome. This is a stem cell disorder. Puppies with this disorder are quite often mistaken for healthy Blue Merles, even though their colour is a silver grey. Affected puppies rarely live more than 6 months. For a puppy to be affected, both the sire and the dam have to be carriers of the disorder. Herding dogs of collie type have long been widespread in Britain, and these can be regarded as a landrace from which a number of other landraces, types, and formal breeds have been derived, both in Britain and elsewhere. Many of them are working herding dogs, but some have been bred for conformation showing and as pets, sometimes losing their working instincts in the course of selection for appearance or for a more subdued temperament. Herding types tend to vary in appearance more than conformation and pet types, as they are bred primarily for their working ability, and appearance is thus of lower importance. Australian Cattle Dog. Dog used in Australia for herding cattle, one of several Australian dogs interbred with the wild Dingo. Dogs of this type are also known as Queensland Heeler, Blue Heeler and Red Heeler. Powerful build, erect ears, short-haired, mottled grey or red with solid colour patches on head, and no white. Australian Collie or "Bordaussie". Not actually a breed, but a popular crossbreed between two other collie types, Australian Shepherd and Border Collie. Appearance intermediate between parents. Australian Kelpie. 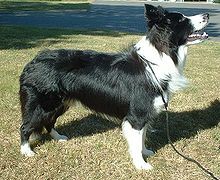 Developed in Australia from collies originally brought from Scotland and northern England. Erect ears, short-haired, usually black, black-and-tan or red-and-tan, with white limited to chest and toes. Australian Shepherd: Derives its name from the sheep imported from Australia in the 19th century, but native to the Western United States. Used as both a drover and guardian of sheep and cattle. Ancestry almost certainly includes British collie types and Basque and Spanish sheepdogs. Shaggy mid length coat in every colour including merle, half prick ears, bobbed tail, and (very important) eyes of different colour, heterochromia very common. Australian Stumpy Tail Cattle Dog. Dog with stumpy tail used in Australia for herding cattle. Erect ears, lightly built, short fur, mottled grey or red with no white, and either no tail or a very short tail. Bearded Collie. Now largely a pet and show breed, but still of the collie type, and some are used as working dogs. The Beardie has a flat, harsh, strong and shaggy outer coat and a soft, furry undercoat. The coat falls naturally to either side without need of a part. Long hair on the cheeks, lower lips, and under the chin forms the beard for which he is known. All Bearded Collies are born black, blue, brown, or fawn, with or without white markings. Some carry a fading gene, and as they mature, the coat lightens, darkening again slightly after one year of age. A puppy born black may become any shade of gray from black to slate to silver. The dogs that are born brown will lighten from chocolate to sandy, and the blues and fawns show shades from dark to light. Dogs without the fading gene stay the color they were when they were born. The white only occurs as a blaze on the face, on the head, on the tip of the tail, on the chest, legs, feet, and around the neck. Tan markings occasionally appear on the eyebrows, inside the ears, on the cheeks, under the root of the tail and on the legs where the white joins the main color. Blue Lacy. Grey or red all over, short hair, floppy ears. Derived partly from the English Shepherd, with other non-collie breeds. Border Collie. The most well known breed for herding sheep throughout the world. Originally developed in Scotland and Northern England. Not always suitable for herding cattle. Ears semi-erect or floppy, fur silky or fairly long, but short on face and legs; red, black, black-and-tan or merle, all usually with white over shoulders, alternatively mostly white with coloured patches on head. Coat can be either long or short. Cumberland Sheepdog. An extinct breed similar to the Border Collie and possibly absorbed into that breed. An ancestor of the Australian Shepherd. Erect or semi-erect ears, dense fur, black with white only on face and chest. English Shepherd. 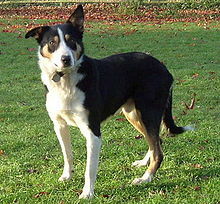 Developed in the US from stock of Farm Collie type originally from Britain. Floppy ears, thick fur, red, black or black-and-tan, with white over shoulders. Not to be confused with the very different Old English Sheepdog. Farm Collie. Landrace herding dog found on many livestock farms in Britain, in the US (derived from British dogs) and perhaps elsewhere. In Britain, often simply called "farm dog", or, loosely, "Border Collie". Very variable in size and appearance. Huntaway. Developed in New Zealand from a mixture of breeds, probably including some collie – but it is not of the collie type. Larger and more heavily built than most collies, floppy ears, most commonly black-and-tan with little white. Lurcher. Not a breed, but a cross of collie (or other herding dog or terrier) with Greyhound or other sight hound. Traditionally bred for poaching, with the speed of a sight hound but more obedient and less conspicuous. Variable in appearance, but with greyhound build: floppy ears, tall, slender, with small head, deep chest and "herring gut"; smooth, silky or rough coat, often brindled. McNab Shepherd. Developed in the US from Scotch Collies and dogs imported by Basque sheepherders. Variable in size, erect or semi-erect ears, short to medium fur, black or red with some white on face, chest and/or feet. New Zealand Heading or Eye Dog. Developed in New Zealand from Border Collie heritage and used to bring sheep towards the shepherd, especially with strong eye contact and no barking. Old English Sheepdog. Derived from "Shags", hairy herding dogs, themselves derived from "Beards", the ancestors of the Bearded Collie. Modern dogs larger than most collies, no tail, floppy ears, long silky hair (including on face), usually grey and white. Not to be confused with the English Shepherd. Scotch Collie, separated into two varieties or breeds: Rough Collie and Smooth Collie. They are still used for herding as well as for showing. They were developed in the highlands of Scotland which is why they needed a profuse coat and  They are rather a different type to other collies with a long narrow face, tall, profuse coar and semi-erect ears. There are four recognised colors: sable, tri-color, blue merle and color headed white. Non-recognized colors are: bi-black, sable merle, harlequin, red merle, red tricolor and black and tan. Both the Rough and Smooth Collies are double-coated with Smooths having a shorter or "smooth" outer coat. There are three different coat types of Rough Collies: Brandwyn (fluffy coats), Parader (flat long coats) and the working type (medium-length coats). Shetland Sheepdog. A small show and pet breed developed in England partly from herding dogs originating in Shetland. The Shetland dogs were originally working herding dogs, not collies but of Spitz type (similar to the Icelandic Sheepdog). However, in the development of the modern breed these Spitz-type dogs were heavily mixed with the Rough Collie and toy breeds and are now similar in appearance to a miniature Rough Collie. Very small, nearly erect ears, long silky fur on body, most commonly sable or merle, with white over shoulders. Smithfield. Originally a British type, now extinct: a large, strong collie, white or black-and-white, floppy-eared, used for droving cattle in the south-east of England, especially the Smithfield Market in London. Occasionally the name is used for modern dogs of a somewhat similar type in Australia. The name "Smithfield" is used to describe the shaggy Tasmanian farm dog of Bearded Collie type; and is also applied to the Australian Stumpy Tail Cattle Dog and may have contributed to the Australian Koolie. Welsh Sheepdog. Landrace herding dog from Wales. Erect or semi-erect ears, short or silky fur, red, black, black-and-tan or merle, all usually with white over shoulders. Blanco, pet of Lyndon Johnson. Two famous white Collies owned by United States President and Mrs. Calvin Coolidge. A large oil painting hangs in The White House of First Lady Mrs. Coolidge and one of their white Collies. Pickles, known for his role in finding the stolen FIFA World Cup Trophy in March 1966, four months before the 1966 FIFA World Cup kicked off in England. Reveille, a Rough Collie, official mascot of Texas A&M University. Pal, who played Lassie (see below). Seamus, pet of Humble Pie front-man, Steve Marriott. Seamus' howling was recorded by Pink Floyd and the resulting song, "Seamus" was released on their album, Meddle (1971). Dog, the Border Collie of the comic strip Footrot Flats. Fly, the sheep dog featured in Arthur Waterhouse's "Fells" trilogy for children, Raiders of the Fells (1948), Rogues of the Fells (1951) and Fly of the Fells (1957). The collie type is not specified, but the illustrations look rather like a Rough Collie. ^ Hubbard, C L B, Dogs in Britain, A Description of All Native Breeds And Most Foreign Breeds in Britain. Macmillan & Co Ltd, 1948. ^ Iris Combe (1987). Herding Dogs: Their Origins and Development in Britain. ^ Francais, Johnson, Isabell, Carol Ann (2005). 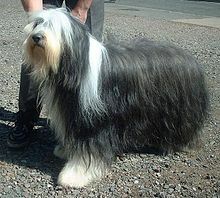 Bearded Collie. Kennel Club Books. p. 158. ISBN 1-59378-236-5. ^ a b Hartnagle-Taylor, Jeanne Joy; Taylor, Ty (2010). Stockdog Savvy. Alpine Publications. ISBN 978-1-57779-106-5. ^ a b Iris Combe & Pat Hutchinson, The ancestral relationships of contemporary British herding breeds, 2004. Archived June 14, 2009, at the Wayback Machine Chart of relationships between various British herding dog breeds, and outline of their history. ^ Dean, Jon (18 March 2016). "How my dog found the stolen World Cup trophy - and put me in the frame". Retrieved 26 April 2018.